Now that the S&P 500 has crossed into new high territory (above the 2007 peak), is the U.S. index starting a new secular trend, as it did in the 1980s and 1990s? The answer greatly depends on whether or not you add inflation. The S&P 500 has advanced above a decade-long resistance line of 1550, twice tested (2002 and 2007) and through on the third try (2013). But when the index is adjusted for inflation, a different picture emerges. In Chart 1, the red lines represent the secular bear markets, and the blue lines the secular bull markets. Both are inflation-adjusted. In the 1980-2000 bull market, the S&P rose by an astonishing 666%. In the current cycle (red line), the real (inflation-adjusted) S&P 500 is still 22% below the 2000 peak. Are we now in a new secular bull market? The answer would have to be no. 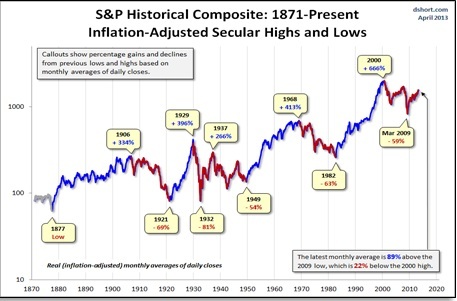 If we were to adjust for the latest Consumer Price Index numbers (1.1%), the U.S. index would have to advance another 125 to 150 points to begin a true secular bull market. Are we going to be starting a secular bull? No one knows. At the start of last month, the media was full of predictions from market pundits forecasting a drop in mid-year. 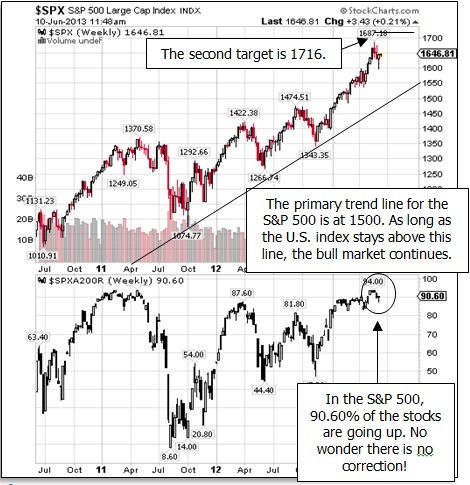 The “Sell in May and go away” advocates were suggesting, like clockwork, that a correction was going to start. However, a quick analysis of the S&P 500’s strength would have quieted those fears. One of the most reliable gauges for determining the internal strength of a market, and the likely near-term direction, is the percentage of stocks trading above the 200-day moving average (m/a). When this is overlaid on the index, a more complete picture emerges. Chart 2 shows the S&P 500 Percentage Index and the S&P 500. The lower graph is at 90.60%, which means that nine out of 10 stocks in the S&P are going up! Certainly not the conditions for a major sell-off. The advancing US$ is truly playing havoc with this precious metal. Gold is particularly sensitive to the movements of the U.S. dollar, and with an outlook of $0.86 for the greenback, the yellow metal has only one direction to trade – downward (Chart 3). Models point to a first target of $1,325 to $1,350, and then lower to the target of $1,250 (see page 16). 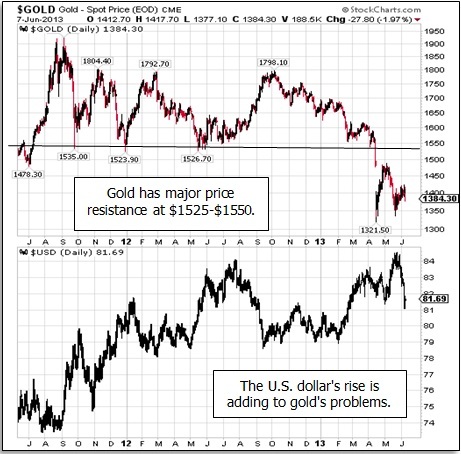 So if investors had any doubts about the end of the long-term bull trend in gold, they only need to look at Chart 4. In April 2013, the metal broke the main upward trend for the first time since 2002. There was also a spike in institutional volume, selling out of the metal, in April. 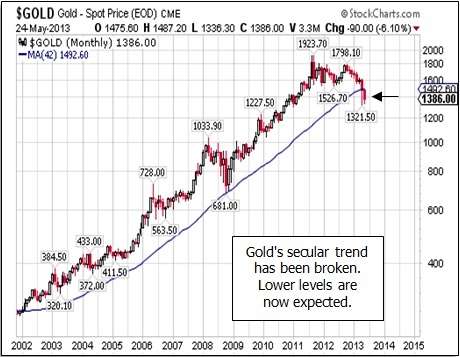 Bottom line: Gold’s main upward trend has been broken. The expected movement now is for a gradual decline to lower price levels. The first downside target of $1,325 to $1,350 was met. The next lower target is $1,250.